Posted on Wed, Nov 9, 2011 : 1:17 p.m.
Demolition has started on the City Places houses on South Fifth Avenue in Ann Arbor. The first of seven came down today and the rest are expected to be leveled by the end of the week. There's a big pile of rubble on South Fifth Avenue where a century-old house once stood, and soon six other houses surrounding it will be leveled. The developer of City Place student apartments project today demolished the first of seven houses that stand in the way of the controversial development that has been at the center of a fierce community debate about historic preservation for the last three years. 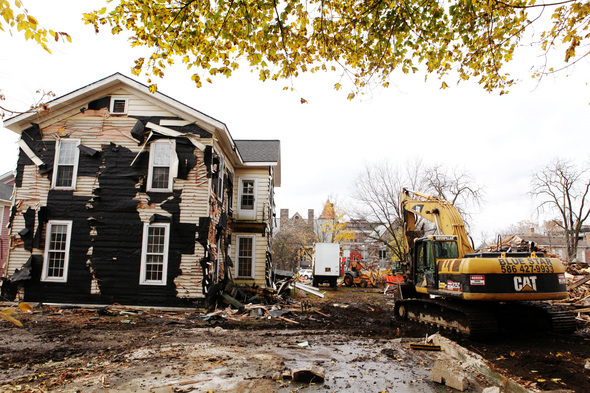 The city of Ann Arbor issued the demolition permits on Tuesday. Sources close to the project say the rest of the houses should be demolished by the end of the week. Residents of the Germantown neighborhood are mourning the loss of the houses, which they believed added to the charm and character of their near-downtown neighborhood. Some have argued that the houses should be protected under a historic district, but the Ann Arbor City Council rejected a proposal to give the neighborhood that designation. In addition to the house that was demolished today, the front porches have been ripped off some of the other houses along Fifth Avenue, just south of William Street. A minority group of council members — Carsten Hohnke, Sabra Briere, Mike Anglin and Stephen Kunselman — blocked an alternate development for the site known as Heritage Row, which would have restored the houses and added new apartments behind them. Hohnke and Anglin said recently they were willing to give reconsideration to Heritage Row, but developer Jeff Helminski ultimately determined the project previously proposed by developer Alex de Parry, who turned the project over to Helminski, wasn't economically viable. "It's a sad day, no doubt," said Kunselman, who stopped on his bicycle to watch the demolition today. He grew up nearby and said he'll miss the houses. "It's a sad day all around," he said. "But we have to move on, and I think the big point now is that we have to understand that we have some rules to change in our zoning law to prevent the consolidation of multiple properties in existing neighborhoods to create these mega projects. These mega projects is what the problem is." Fri, Nov 11, 2011 : 6:52 a.m.
Alex de Parry wanted to build a nice apartment complex that would have renovated and preserved these old houses, but self-interested parties (&quot;Germantown&quot; residents, absentee landlords trying to keep out competition and pandering city council members) fought tooth-and-nail to block his proposal. So this is the result: old homes destroyed and a new student dorm-type apartment complex on the way. I hope the knee jerk anti-development crowd is well pleased with what they've accomplished. Thu, Nov 10, 2011 : 5:07 a.m.
Thu, Nov 10, 2011 : 12:02 a.m.
DeeDee -- I hope that you will post copies of your family album photos on the internet -- on Flickr or perhaps on the Ann Arbor District Library's photo sharing site. It sounds like they might be valuable historical documents which future Ann Arborites will enjoy seeing years from now. Area residents should consider giving their old photos to the University's Bentley Historical Library, which maintains the Sam Sturgis Collection and other precious archives of images from all the communities of Washtenaw County. (Those who don't want to part with the originals can donate copies.) Folks who would like to see photos of these doomed houses as they appeard before the Vandal horde descended on them, should go to Flickr and click on the superb images taken by the late Jeff Lamb. A search for the &quot;Ann Arbor Seven&quot; (Jeff's term) should get you into his photostream. Thu, Nov 10, 2011 : 1:21 a.m.
Thu, Nov 10, 2011 : 1:04 a.m. Thanks for posting this Wystan. If anyone knows the value of these old homes it's you. Wed, Nov 9, 2011 : 9:45 p.m. So, sad - an irreplaceable piece of heritage architecture is gone. For those who think they are undermaintained eyesores, look at all the boring, modern undermaintained apartments/eyesores around this town - the old ones at least have character. I have a family album with pictures of my grandmother and great uncle in front of a grand old home in the same general area. The old house across the street is still there, but the home my grandmother lived in, is now an ugly, undermaintained modern eyesore. More residents will look at their old family albums and see this when these houses are gone . Thu, Nov 10, 2011 : 2:28 a.m.
Ann Arbor is going to become another Detroit. Ugly run down old apartments that the students will rip apart. Glad to hear of a memento that is still in the family. Cherish it always. Wed, Nov 9, 2011 : 9:20 p.m. This is just so sad and unnecessary. Wed, Nov 9, 2011 : 8:27 p.m. Gross and disgusting. Our city &quot;leaders&quot; and I use that term loosely, have utterly and completely failed not just the community but our history as well. It is a total embarrassment that our progressive city can't even save something of historical value. SEVEN houses, not one, I'm ashamed that they let this happen. This is far worse than the boxes built in the 60s in beautiful neighborhoods - this decimated the entire block. Wed, Nov 9, 2011 : 8:26 p.m.
A lot of people are describing these houses as eyesores. I can't imagine the bland apartments that replace them will be any improvement. Hopefully this will spark a reconsideration of a Germantown historic district. Wed, Nov 9, 2011 : 8:53 p.m. They are not historic and have NO redeeming architectural features. Yes, they are old, so is the stadium bridge. The bridge and the houses fall into the same category - old and dilapidated. Wed, Nov 9, 2011 : 8:49 p.m.
Why? There is no there there. With the exception of the church, which is beautiful and nicely maintained, and a just a few beautiful, owner occupied, homes the rest is not worthy of historic district designation. They were right to vote it down. The article and some comments blame those who voted against another development on the site, but the real shame lies with those from the Mayor's Cabal who bowed to special interests and nixed a historic district for the area (the Mayor, knowing what the result would be, voted for it, but we all know what that means). Please also note that de Parry, on these very pages, contested Helminski's claim that Heritage Row was not viable. The new developers never had any intention of returning to Heritage Row, even though there was every indication that the last time it would have passed. They actually want to build City Place, and even claim to be proud to present it, which will stand as a monument to bad taste, greed, and ill will. Please stop blaming everyone else: it is the new development team that bears all the blame for this architectural junk that will stand so close to downtown. They could have at least modified a plan that was designed to be so ugly as to scare council into voting for Heritage Row, but they chose to just go with what was drawn up. It was their choice and they must be held responsible. Let us hope that this is their last gutting of our city. Wed, Nov 9, 2011 : 8:19 p.m. Blame the council - when faced with inevitability of the project moving forward, some on council turned tail and said &quot;Oh, wait, lets reconsider...&quot; I applaud the ability of developers to not go mad when dealing with the council. Wed, Nov 9, 2011 : 7:48 p.m. The mayor voted for both Heritage Row and the historic district. Wed, Nov 9, 2011 : 7:43 p.m.
&quot;Some have argued that the houses should be protected under a historic district, but the Ann Arbor City Council rejected a proposal to give the neighborhood that designation.&quot; Funny-you don't list the Council Members who voted against this. Why not? Thu, Nov 10, 2011 : 2:25 a.m. It is who you voted for and vote for that can cause this to happen to beautiful old homes like these. So, we are going to get cookie cutter apartments and another on Main Street. Old West side is brewing in their juices over that little ditty about to be built. Good luck with the eye sores. Wed, Nov 9, 2011 : 9:07 p.m. Wed, Nov 9, 2011 : 8:17 p.m.
Um, votes by the council are public record. Look them up. The vote is also old news and not the focus of the story. Search the site for stories that covered the historic district vote. No black helicopters to see here. Wed, Nov 9, 2011 : 7:20 p.m. Wed, Nov 9, 2011 : 7:19 p.m.
Thankfully, these dilapidated eyesores are going to be gone. There has been no maintenance to many of these for 10+ years. Wed, Nov 9, 2011 : 8:13 p.m.
Not doing maintenance was a calculated business decision. Makes it easier to call it an eyesore when you create an eyesore. I'm surprised they didn't try to get city money for the demolition. Greed wins the day. Wed, Nov 9, 2011 : 8:07 p.m. I wonder if you live in one of those McMansions that I consider eyesores? Wed, Nov 9, 2011 : 7:10 p.m. Interesting that three of those council members had their decision making over the past two years validated by landslide victories yesterday. I imagine that will also be the case for the fourth council member next year as well. Wed, Nov 9, 2011 : 6:55 p.m. This breaks my heart. What has become of the Ann Arbor that cared about its history and beautiful older homes?? So sad. Shame on the leaders that allowed this to happen. Wed, Nov 9, 2011 : 7:23 p.m.
Just because something is old does not make it good. A lot of those houses were dilapidated. Keeping around run-down houses does nothing but increase blight and allows less land for developments that will ultimately lower housing costs. If there was some intrinsic historic value, I have no doubt AA would have allowed the buildings to remain. As it stands, these are just old eyesores making everyone else's life expensive.